In our 13 year history, we never received so many excellent scripts. The only other year that comes close is 2008. Although our evaluation process is a tough one, in 2015 many scripts were Finalists or received Honorable Mention. Congratulations to all the playwrights cited below! 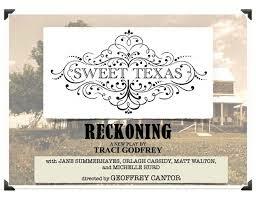 2015 FIRST PLACE: Sweet Texas Reckoning by Traci Godfrey. Ellie Wolcott, a Southern Baptist woman fearing a tepid and lonely old age, attempts to reunite her daughter, Kate, with long time paramour Alan John in order to salvage her remaining years with some semblance of dignity. When Kate shows up with an unexpected “guest”, Ellie is forced to confront many demons, including her ideas about race, biology, bigotry, and sexuality. A gay couple faces the unexpected death of their adopted infant son who they were about to meet for the first time. 2015 THIRD PLACE: The Perp by Robert Gabrielli A flailing young DA receives help from an escaped perpetrator in exchange for hiding him in her office. This smart, creative, laugh-out-loud comedy, with its jungle gym-like set, is filled with pointed comments about relationships, personal responsibility, and situational ethics. ​SWEET TEXAS RECKONING will receive a full-up run at Artemisia, a Chicago Theater - early 2018. SWEET TEXAS RECKONING received a reading, Dec 12, 2016 at the Physics Theater on West 43rd Street, in the heart of NYC's theater district. A workshop of SWEET TEXAS RECKONING was produced at the Hudson Guild in NYC, as part of the 2015 Thespis Theater Festival. CLICK on the image above for more information about the Hudson Guild production, producer Linda S. Nelson, and playwright Traci Godfrey. SWEET TEXAS RECKONING is the Winner of the Artemisia, A Chicago Theatre Playwriting Competition 2016. SWEET TEXAS RECKONING is the Winner of the 9th Annual Pandora's Box Theater Festival that was produced at the Garage Theater in Long Beach, CA October 2015. The play received a full production there April 2016. An excerpt from the Orange County Register's review of that production: "Some playwrights get it right, their plays seemingly holding a mirror up to life. That's definitely the case with Traci Godfrey and her new play 'Sweet Texas Reckoning.' Godfrey's superbly crafted comedy-drama is very much along the lines of, and in some ways surpasses, any of the great works of Horton Foote (screenplays include 'To Kill a Mockingbird' and 'Tender Mercies'), known for his lifelike dialogue and realistic approach to characters whose roots are often in the Deep or Rim South." For OCR's review with plot summary, CLICK HERE. CANCELLED is part of Little Fish Theatre's "Pick of the Vine Short Play Festival" produced Jan 8 - Feb 13, 2016 in San Pedro, CA. CONSENT: Frank J. Avella is the recipient of a 2015 Fellowship Award from the NJ State Council on the Arts for his play, CONSENT. CONSENT: Frank J. Avella is the recipient of the 2016 Helene Wurlitzer Residency Grant and Chesley/Bumbalo Foundation Playwright Award for CONSENT. CONSENT was a semifinalist at the 2012 O'Neill National Playwrights Conference. CONSENT received a reading in 2015 at the Abingdon Theater Co., NYC. CONSENT received a reading in 2011 at The Dramatists Guild Friday Night Footlights Series, NYC. CONSENT received a reading in 2013 at Urban Stages, NYC. CONSENT received a development workshop in 2012 from Celebration Theater in Hollywood, CA. CONSENT will be published by Adirondack Plays as part of an anthology of LGBTQ Plays. BLUE OVER YOU was a finalist in FutureFest 2015 at the Dayton Playhouse in OH. GENTLE PASSAGE is part of the 2016 Hollywood Fringe Festival, with performances at the Artworks Theater. GENTLE PASSAGE is the winner of the Pride Films and Plays’ 2014 Great Gay Play and Musical Contest. The play received an enhanced reading at Center on Halsted, Chicago, IL. GENTLE PASSAGE is part of the 2012 Hollywood Fringe Festival, with performances at the Artworks Theater. MICHELANGELO AND TOMMASO was a finalist in the stage play division of the New York Screenplay Contest. MICHELANGELO AND TOMMASO was a finalist in Pride Films and Plays’ 2014 Great Gay Play and Musical Contest. The play received an enhanced reading at Center on Halsted, Chicago, IL. MICHELANGELO AND TOMMASO is published by Theophania Publishing. MY SON by Shelley Segal. See the TEDxEAST performance of the play: CLICK HERE. STOLEN MOMENTS by Paul Elliott was produced by ALAP in 2015. TRANS TASMIN received a reading in 2015 at The Court Theatre, Christchurch, New Zealand.